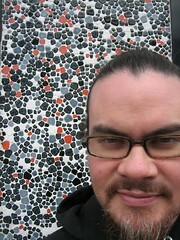 I just discovered that one of my blog colleagues in Australia, Seb Chan, is writing about a topic of mutual interest - social media metrics (my blog ramblings here and my wiki/presentations here). I am also prepping a panel on the topic for NTC (more about that later) Seb Chan is focusing specifically on blog metrics for museums. In our paper Jim and I avoided site traffic and instead proposed that two better measures of success for museum blogs were citations/linkbacks and user comments. These captured the ‘interactivity’, the multidirectional communication, that most museums set up blogs to encourage and explore. Ok so you are talking, people are listening, and lo and behold they are talking to you on your blog as well. Hurray!! But in a world of networks and connections what is your impact beyond your immediate blog? A key validating factor for a blog, any blog, is that other people talk about what you are writing about. They reference back to you (with nice words or scathing critiques!). They link to you. I call these Citations. People talk about you, discuss you point, throw up on you, praise you. Citations. 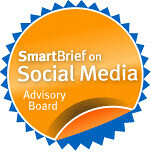 To measure Citations I use Technorati rank. 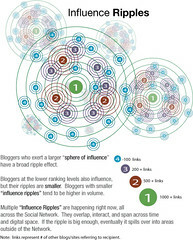 It Technorati the best measurement tool for measuring ripples or "influence"? KD Paine notes why measuring blog influence isn't so easy with a pointer to Brendon Cooper titled "Which Metric is the Most Important" that discusses looks at different method to measure influence in the blogosphere. (He is the originator of the PR Power Index) Take it all with a grain of salt. Another explanation of influence can be seen in this illustration of ripples, I came across this visual a few months back from David Armano. Seb, I have a few questions .. Where is the paper you refer to located? Is it here? It's on my reading list. For your metrics/measurement for the new blog, what will that look like? Do you have plan or logic model to share? What is your impression of the flickr stats feature? In your institution, what are some of the attitudes about evaluation metrics that you need to change or challenge when thinking about a social media measurement plan? What easily connects to your existing practice of metrics/measurement for the Museum Web and what does not? Actually I'm preparing a range of materials on a new set of web metrics for museum web content in general - not just blogs and social media. Fundamentally metrics for the museum sector are broken. They are even more broken when museums start experimenting with social media. The paper will be published online at the time of the event and I will also be blogging extensions and tangents to the paper. It builds on a lot of work in different fields and sectors, and proposes a new 'ecology' of metrics for museums whose online content now is spread across 1.0, 2.0 and multiple sites.